a Shop Girl shows a Society Leader what it takes to Hold a Man! Bette Davis is the girl from 10th Avenue. 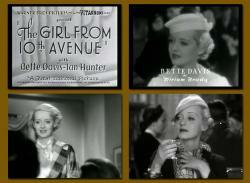 The Girl from 10th Avenue is a nice little Bette Davis picture from Warner Bros. in 1935. It was based on a Broadway play that had opened in 1914. Davis plays Miriam Brady, the titular female; a working class girl who happens upon prominent attorney Geoffrey Sherwood (Hunter) one day while on her lunch break. He’s in the middle of a bender after getting jilted by his fiancée. By the time Geoffrey sobers up he and Miriam are married. She assures him she won’t take advantage of the situation. She's a bit common (try to count the number of times she uses the word swell) but she has intelligence and heart. She just wants to help Geoffrey get back on his feet, and she will give him his freedom anytime he says. Of course she then goes and falls immediately in love with him. The wonderful character actress Alison Skipworth plays Mrs. Martin, landlady to the newlyweds. She is a former Floradora girl (think Marie Dressler in Dinner at Eight) who coaches the newly minted Mrs. Sherwood in how to act and speak in a more cultured manner. Bette Davis is not remembered for her comic timing but in this movie, and particularly in that scene, she proves she had it. Earlier she delivers this line about Valentine with just the right panache. “That dame certainly knows how to make men bugs!” Later she has an explosive dramatic moment where she tells Geoffrey off before storming out. She really sinks her teeth in. Davis also demonstrates that, although never a classic beauty, she was quite attractive when in her twenties. She possessed style and knew how to walk, move and stand in the cunning little creations designed for her by Orry-Kelly. In fact all the gowns he created for this movie are quite memorable. The chemistry between Bette Davis and Ian Hunter is a bit weak. He is adequate at best but lacking in charisma. Dr. “It’s Alive!” Frankenstein himself Colin Clive shows up as the man that Valentine left Sherwood for. He has one good scene near the end where he is drunk. 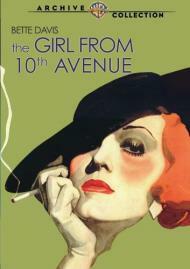 The Girl from 10th Avenue runs less than 70 minutes but packs plenty of plot. Boy they sure knew how to tell a story and keep things moving in those days.